Can You Replace Commercials on Cable or DirecTV? The short answer? Yes, you can. However, you’ll probably want to avoid doing so, because it likely constitutes a breach of contract with your television provider. With so many “terms of service” pages you’ve agreed to when signing up, it’s easy to miss what you are, and aren’t allowed to do. Even the most common luxuries there are limits; like what you can or can’t do with your TVs. Questions like the one above, or others like “Can I remove commercials from my TV” or “Do I need to pay extra to show DVDs in my business?” are the key to running a safe ship. While your business may be focused on selling a product or service to a customer, media companies aren’t much different. They make money off of the use of their media properties and/or through advertising that pays for the creation of the content. This article will address an issue that’s becoming more frequent, which is the idea of modifying, or substituting television commercials on your business TV. There are companies that have made it their mission to create software to help you break the rules. Unfortunately, using the so-called “solutions” can create more problems than it’s worth. With the way technology is constantly evolving, there’s not a lot you can’t do. But just because you can do something, doesn’t mean you should. Your business shouldn’t have to pay the price. Often times, business owners aren’t even aware that what they’re doing is illegal; especially not when companies are selling them television solutions that encourages them to do prohibited things in the first place. The sticky part is, if you hire, or partner with a company that provides you a service which lets you modify your cable subscription; it doesn’t make you any less liable. For the same reasons you can’t play Netflix, or DVDs in a place of business, you can’t alter a portions of broadcasts when they don’t suit your needs. Let’s look at a separate example of tech companies helping you break the rules. Take speeding in your car for instance. No one wants to get a speeding ticket. Radar jammers were invented to block a police officer’s ability to measure your speed while you are using it. But they are illegal in all 50 U.S. states. The penalty for using a radar jammer is much worse than the few hundred dollar fine you’d get for speeding. Federal law provides up to a $75,000 fine and possible imprisonment! And the radar jammer manufacturer isn’t going to owe the money or serve the time. As the person that got caught using it, you will. Why are you Replacing Commercials in the First Place? It’s a bad sign if you get to this point. If you’re trying to replace unwanted commercials that keep showing up on your business TV, what does that tell you? It illustrates how you’re not in control of what’s on your TV. It demonstrates how services like cable and DirecTV aren’t really a fit for businesses in general. Yet so many business owners settle for it, despite there being alternatives that cost less, and let you do more. There’s a silver lining to all of this, though. If you’re trying to modify the commercials on your cable, or DirecTV supscription, it means you recognize how harmful certain commercials can be for your business. Dealerships obviously don’t want ads for other local dealerships running on their TVs, and fast-food restaurants wouldn’t want ads for cheaper coffee, or better meal deals from a franchise across the street. In the end, there’s better ways to market your business than a costly cable subscription. There’s It’s Relevant. It’s Relevant TV is the solution you’re looking for if you’re a business owner, and you want to overwrite competitive commercials, but keep the TV content. It’s Relevant keeps competitive commercials automatically. Plus you can showcase your own spots among the premium content IRTV provides. Everything is safe, family-friendly, and things people genuinely enjoy watching. It’s a television service that gives you control over what comes on the TV, and costs less than what most businesses are paying for cable, or digital display software. The best part? No more paying a cable company to play competitor ads in your business. If your business TV is playing poor content, and you’re not there to watch it, are visitors still seeing it? Yes, they are; and it’s hurting your business, your brand, and your bottom line. If you already know where this is going, and you’d like to explore an alternatives to cable or DirecTV, start here. It isn’t the TV that’s hurting your business, as much as it is the programming that’s playing on it. A big part of the problem is a lack of awareness. Business owners don’t always know what’s on the TV. Whether they’re behind the counter, in the back office, or even working from home – you don’t know what’s playing unless you’re sitting in front of the TV, watching it. So chances are, you’re not seeing how the TV that you bought to entertain your visitors is actually showing boring politics, graphic news, or even worse; COMPETITOR ADS. Nothing beats being the owner of a business that sells something like coffee and breakfast fixings literally paying to have competitor ads show up in their business, advertising where to get the same things; but cheaper. That’s effectivly what you’re doing by choosing services like cable and DirecTV to power your business television. You’re paying to invite other brands to steal your customers away; outshining your own brand and reducing your monthly revenue. The worst part? No one’s really interested or even enjoying the programming that’s playing. When was the last time you sat down at a fast-food restaurant, saw a local news story about a man who was stabbed to death, and as a result had a cheery conversation with friends or family while you ate? Probably never. That kind of programming can is almost certain to create a bad, or awkward experience for your visitors. This can leave a bad impression on your brand, and even impact the chances of your visitors coming back. Identifying the problem is only half the battle. Fortunately, it’s a problem that’s easy to address. Until recently, there never really was much else to put on the TV other than cable; but as technology evolves, forward-thinking business owners are turning to services that cost less, with features that improve their marketing, and host content that is engaging, and family-friendly. IRTV, or It’s Relevant TV, is television software that business owners across the country are taking advantage in order to become more relevant to their customers; using it as a customizable marketing tool, one that replaces the boring, graphic, and unwanted content with videos that people genuinely enjoy watching. If you’re a business owner, or you manage a business with a TV; take 3 minutes out of your day and put yourself in the shoes of your customers. Watch the TV, see what they’re seeing, and consider whether or not you’re getting the most out of your service. Don’t be afraid to change what’s on the TV. If you’re a business owner, marketing professional, or someone in charge of visitor experience; and you don’t know what’s on your TV in your waiting areas, you may want to keep reading. This article will highlight some of the things that are appearing on your waiting room TV without you realizing it. Why knowing what’s on your TV is Important. Some people say “what you don’t know can’t hurt you,” but in reality, the exact opposite is true. In the case of your waiting room TV, not knowing what’s playing can come back to haunt you. It’s like leaving your garage door open for the day; you have no idea how many unwelcome squirrels, birds, and mice may have found their way inside. You might think you have the TV tuned to something safe, or family-friendly; but with cable, DirecTV or a medical service provider, you don’t know unless you’re there in person. Unless you’re in control of what’s on your TV, there’s really no telling what your visitors might be exposed to. The News, Food Network, and channels like E! are the go-to standard for waiting room television. What is the purpose of choosing these channels? It’s usually just needing something to put on the TV. TVs are in waiting rooms because they’re a familiar distraction. They can reduce stress, and help pass the time; people put TVs in waiting rooms because they care about the comfort of their visitors. That is their intent, at least. The news is often depressing, violent, and graphic. People in waiting areas don’t want to see how many people died in a shooting. They don’t want to see endless political commentary, graphic images of injured or fearful human beings, or a news story about something bad that happened close by. Nothing says “I’ll think twice about coming here next time” than a string of recent crimes in the area. Channels like the Food Network, HGTV, and E! are tame by comparison, but no less important to keep in mind. Visitors have called these networks boring and frustrating. People have never been more sensitive to the smallest things than they are today; they’ve also never been more able to express those fleeting feelings of frustration over social media and online reviews. Something they saw on your TV, which has nothing to do with your business, could be the reason they go online and rant about their “bad experience”. As a result, you’ll lose potential customers who decide to go somewhere based on reviews. It’s impossible to please 100% of the people 100% of the time, especially with services like cable or DirecTV. However waiting room TV software exists that gives you control over what’s on your TV; allowing you to cater to the interests of many, as opposed to few. In the case of hospitals, clinics, or medical offices, sometimes what’s on the TV isn’t cable, but rather a looping medical display. These programs are detailed, informative, yet very often graphic, anxiety driving or depressing to waiting patients. Cross-sections of the human body, graphic imagery of a clogged artery, or a bold adventure down a 3D-rendered infected colon are not what visitors want to see. This is the sort of content that visitors are watching on your TV if you subscribe to medical waiting room television. It’s gross, it’s unsettling, and if you’re lucky it’s not looping every 5 minutes. If this is going on in your waiting room, take a moment to sit in the chairs as if you were a patient. Watch the TV, and really consider if this sort of programming is actually improving visitor experience. The trick to successful waiting room TV programming is content; content that you control, which appeals to as many people as possible. A good TV display doesn’t loop. It should feature interesting videos that are family-friendly, and should be something you can trust to set it and forget it. It’s Relevant TV is just that. It’s a custom TV network; one that you control. You pick which categories you think your visitors will enjoy, and IRTV does the rest; providing you with non-looping, family-friendly content that is short-form, meaning that chances are high that someone will see a program that interests them during the time they spend waiting. It’s Relevant puts visitors in a good mood, that helps lead to a good experience, which turns into repeat business. We no longer live in an age where standard TV channels are the only thing that can go on a TV. 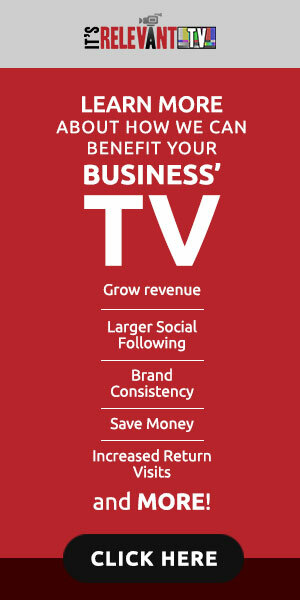 Do more for your business by doing more with your TV. Urgent care marketing doesn’t have to be a drag, and it doesn’t have to cost an arm and a leg. In the past, you might have tried your luck with billboards, ads on buses, in magazines, or even a TV commercial or two – all of which are expensive, and all of which are not guaranteed to reach the people you want. If you want to market your urgent care, look no further than your TVs. Effective marketing for doctors offices comes in many forms. When you think of marketing, the TV in your office isn’t usually at the top of the list. But it should be. Pens, shirts, caps, and other branded take-aways don’t even compare to the potential your TV has to enhance marketing. 1. Netflix / Hulu / Amazon Prime Video / YouTube / DVDs – All of these are illegal to show in a public/commercial setting. Yes, your urgent care is a commercial setting, so don’t take the risk! 2. Cable / Comcast / DirecTV – Which are all costly, don’t give you adequate control, and invite your competitor’s to advertise in your business. 3. Dry / Uninteresting Content – Which creates a boring, or poor environment that you’re paying for. So what is the solution? What options are out there for owners and practice managers who want waiting room TV programming with legal, licensed content, that’s cost-effective; contains programming that they control, and is something visitors will enjoy watching? It’s Relevant TV is a TV app that gives users access to a custom television network made with your business in mind. Its library of interesting licensed content puts visitors in a positive mindset. This is important for your brand and image. Additionally, It’s Relevant lets you to upload your own videos and messaging alongside its content; which informs, and allows you to reach visitors more efficiently- In ways not possible with cable, or a medical TV display. With IRTV, you’re in control of what comes on your TV. You select which categories you want visitors to see, and It’s Relevant does the rest. Don’t settle for free waiting room display software. Instead, look for TV software that’s engaging, easy-to-use, and works with your budget. Visit It’s Relevant, and explore how it can help market your business. Whether it’s cable/satellite tv, a digital signage service, or a custom TV network for your waiting room, you can always count on there being a contract that needs signing before you can get started. Contracts are a necessary tool for any subscription-based service. They outline the terms, conditions, and policies while solidifying the consent of everyone involved. But at the same time they can be tricky and require careful review. How contracts and terms are structured might reveal something you didn’t notice about a service you’re signing into. This article will explore the top 3 risks to avoid before finalizing a contract for your waiting room TV. Plainly put: Because it’s boring. And the service provider knows it’s boring. They know you’re likely to get tired of the dull, repetitive service within a few days or weeks so they make it so you can’t back out of it. If you don’t like it, then chances are your visitors won’t like it as well. In addition it’s important to realize that things change. A better TV service for your waiting room might come along tomorrow, so why prevent yourself from being able to use it by signing a contract today? If you’re stuck in a contract for the next few years, you’re forced to dwell on what could have been. A long-term contract usually means the provider is afraid you’ll back out on them, which speaks to their lack of confidence in their own service. A service with a great library of quality digital content for your waiting room TV can be difficult to find. Unless it’s Netflix, which is illegal to play in public, it isn’t likely to be chock full of interesting videos for people to see. This is particularly true with medical TV displays that loop stress-inducing, and sometimes graphic medical videos. No one wants to see them. People also don’t want to see the same 10 videos repeating again and again while they wait. If it wasn’t interesting the first time, it certainly won’t be the 10th time it plays. Don’t sign a contract until you’ve had the chance to really explore the service. Take time to see for yourself what visitors are going to see when they come in. If you’re curious about a particular waiting room TV software, look into scheduling a demo with the provider. The best bet is to get a risk-free pilot going- allowing you to put the service in place at your location, while having the flexibility to back out of the service if it doesn’t end up being as good as it sounded when you bought into it. A TV service for your waiting room that’s inexpensive is great, even better when it’s free. Not good enough? How about a free TV and a box of iPads? Better, right? Unfortunately no. TV services aren’t free. If someone was giving out hundreds of free TVs and ipads without getting anything in return, he or she would be out of TVs, iPads, and probably a job. Everything has a cost – sometimes it just isn’t what you think. That TV on the wall you get for “free” will be full things you didn’t know you would be getting, like ads- even competitor ads. And those iPads, apart from being riddled with ads themselves, are also riddled with germs from a day’s worth of visitors handling them. Which in the case of a medical office may be unsanitary. TV services that label themselves as “free” make their money selling ads to companies that want to sell their product. Which puts money in everyone else’s pocket but your own. There is truth to it being free, insofar as you aren’t being billed for the service. But it also isn’t making you any money and may be losing you business. Don’t fall for free. It’s Relevant TV is a television network for businesses, designed with businesses in mind. IRTV provides waiting room TVs with programming and a digital signage app which transforms your TV into a tool that improves visitor experience. With It’s Relevant, you control what’s on – selecting from a list of 40+ categories, from a library of over half a million videos. And you don’t get ads from competitors or pharmaceutical companies that might harm your bottom line. Everything is customizable, and can even be controlled from your computer, tablet or smartphone – anywhere, anytime. Visit It’s Relevant.com to schedule a demo to explore how It’s Relevant works and see if it’s a fit for your business.